A fast sport cruiser packed with innovative details. 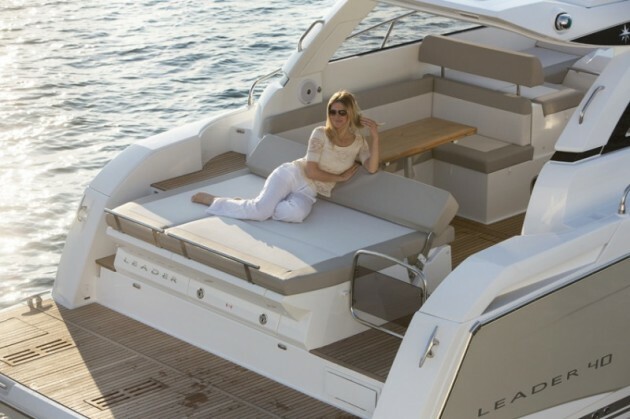 When Jeanneau decided to extend its Leader power cruiser lineup, the company looked to designer Michael Peters, who has a few Viking and Cabo hulls to his credit. The result of his collaboration with the design team is the Jeanneau Leader 40, a sport cruiser with a ton of clever, innovative features. 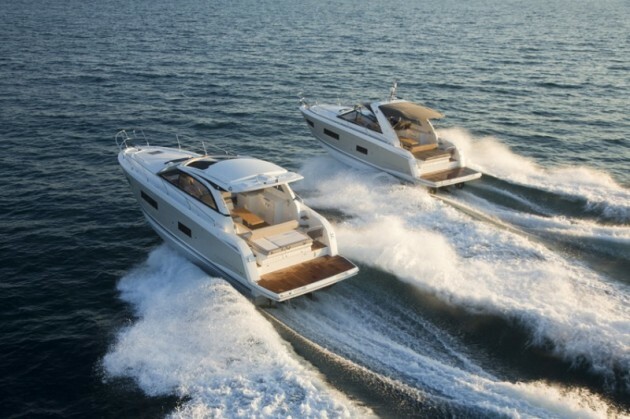 The Jeanneau Leader 40 is available in Sport Top (left) or Open (right) configurations. The Leader 40 comes in Sport Top or Open configurations. The Sport Top has a fiberglass roof that reaches back over the cockpit with an electric sunroof. The Open version has a fiberglass arch fitted with an optional Bimini that extends back over the dining area. 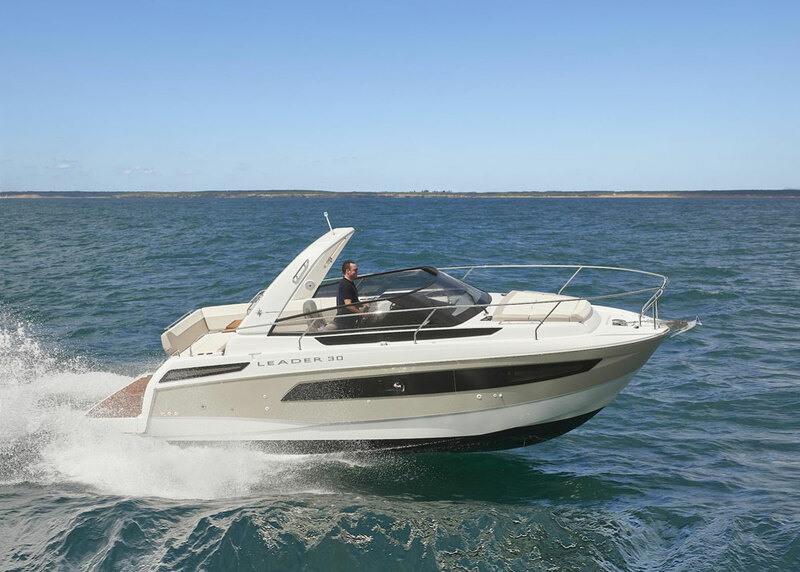 The Jeanneau Leader 40 is a capable cruiser that will most likely be used for quick coastal day trips, but has so many unique features in the cockpit and below that weekending (for one or two couples) may be too tempting to resist. The Leader 40’s cockpit is all about two things: lounging and stowage. Step up from the swim platform (fixed or hydraulic) and you’ll come to the first ultra-loungey spot—a giant sun pad that reclines fully, or inclines at its head. 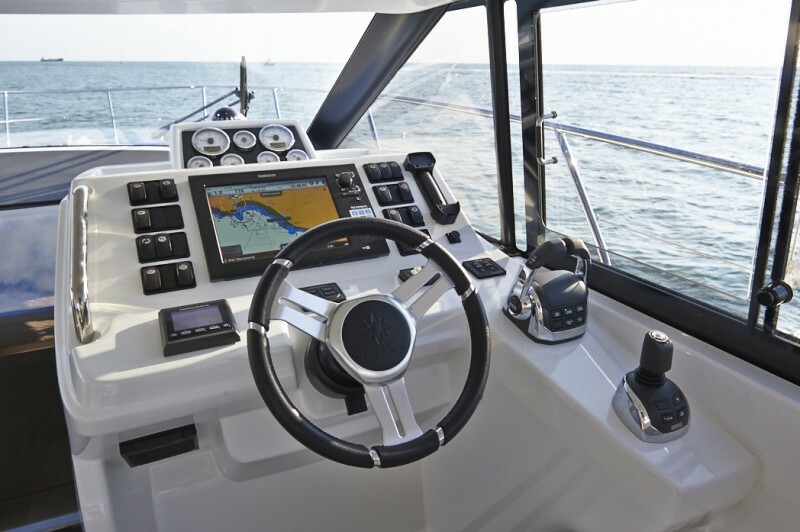 The aft cockpit on the Jeanneau Leader 40 maximizes relaxation. Keep moving forward and duck under the hardtop, or in the Open version, beneath an optional retractable sunshade. Here, the U-shaped dinette is to port and the outdoor galley to starboard. The galley module comes with a sink only, but may be upgraded with an electric grill and a small fridge, so that all meal preparation for day trips can happen outside. A few more steps and you arrive at the helm, which is compact and neatly arranged with analog gauges and has enough room for a single large multifunction display right above the wheel. A sliding window next to the helm seat brings in air, or facilitates communication with anyone on the dock or at the bow. The helm is efficiently presented, although it's a bit bright because of a lot of white spaces that can produce glare. Companion seating has really been thought out well. Two people can sit facing forward, or one can face the captain, while the other faces the windshield. The outboard lounge also faces aft, so you can recline and relax while watching the scenery behind the boat. There's a nice helm setup on the Jeanneau Leader 40, but we wish the dash was a darker color. We found the white produced a bit of glare. Now, let’s discuss the stowage options. Remember that giant aft sunpad? There’s enough room below it to stow a deflated dinghy and its outboard. An additional side panel under the sun pad accesses another space that can house fenders, lines, or a life raft. The space is not just a lazarrette, but rather a cavernous garage. Additional stowage for snorkel gear, personal flotation devices, and more, is located under the cockpit seating and in the small galley. Also, let’s not forget the neatly stowed passarelle (gangway) that looks just like a step riser, until it slides out on the starboard side and provides easy boarding, especially in a Mediterranean moor situation. 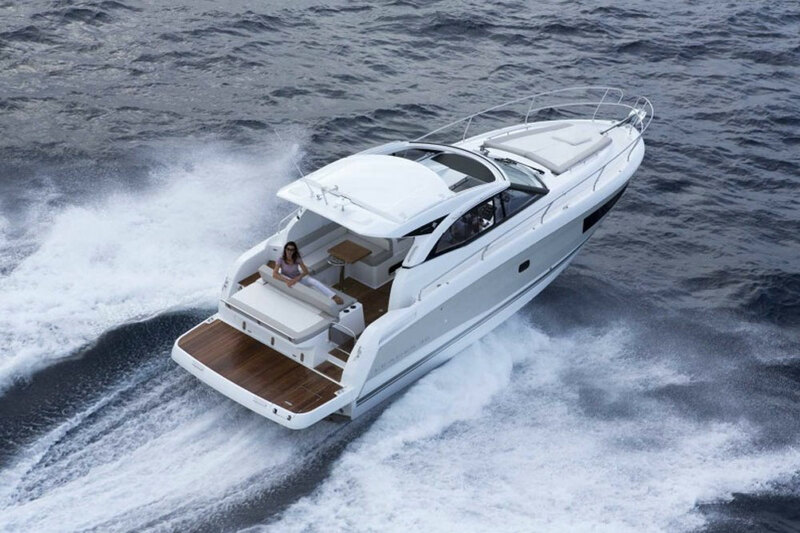 Forty feet is already a good size for a sport cruiser, but the Leader 40 has a way of feeling more like a motor yacht below. Two cabins and one head is the standard layout, but it’s the details that make the accommodations interesting. For example, the master stateroom is in the V-berth and has its own entrance to the single head. The master’s island berth is short, so there is plenty of room to move around it, but you can also add a filler cushion that extends it to six feet, six inches in length. It’s a nice use of limited space. 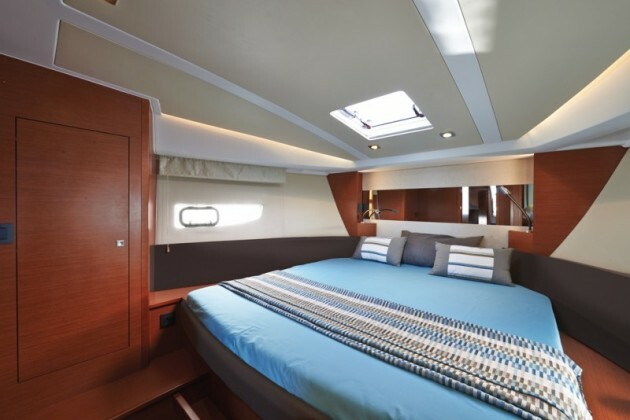 The V-berth master stateroom features an island berth than can be lengthened to full six feet, six inches in length, with the addition of a filler cushion. The aft cabin is no less innovative. There are twin athwartship berths that can connect to form a single queen-size bed, by using two pull-out wooden panels and a back rest to create the filler. This cabin also has a small desk. When you’re done with your correspondence, lift the desktop to reveal a sink with a folding spigot—ideal for evening clean-up without needing to access the head. A portside berth in this stateroom can be used as a lounge and is good for anyone wanting to read in peace and quiet. The U-shaped dinette in the galley/main saloon area can also be converted to a berth with the help of the high-low table. In good weather, you can easily accommodate 12 overnight guests by sleeping a handful in the cockpit, although with only one head, that might be logistically challenging. The galley, which has ample countertop space and cubby holes for just about everything, comes standard with an 85-quart refrigerator, but that can be upgraded to 137 quarts. A microwave is optional. The stove is gas-fueled on European models, and in the United States is electric. There are a few engine packages, including two with diesels (twin 300-horsepower Volvo Penta D4s or twin 370-horsepower D6s), and one gas option (twin 380-horsepower, 8.2-liter Mercruisers). All the twin-engine offerings come with stern drives, and you can also opt for joystick control. Alternatively, you can skip that joystick markup and just add a bow-thruster. 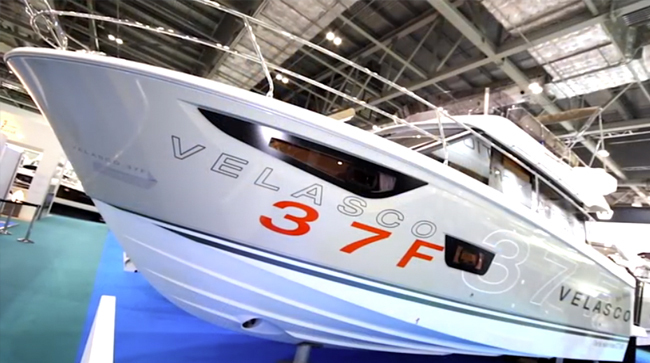 This is a slippery hull and with the D6 package can hit a top speed of 38 to 41 knots, depending on conditions. 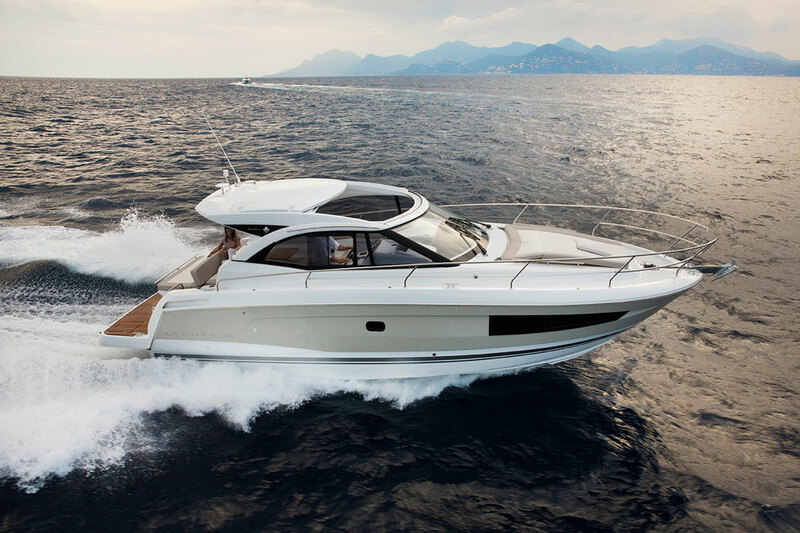 At a more mellow and fuel-efficient cruising speed of 28 knots, the Leader 40 will burn around 21 gallons per hour. Due to the clever details and respectable performance, reception to the new model has been good. 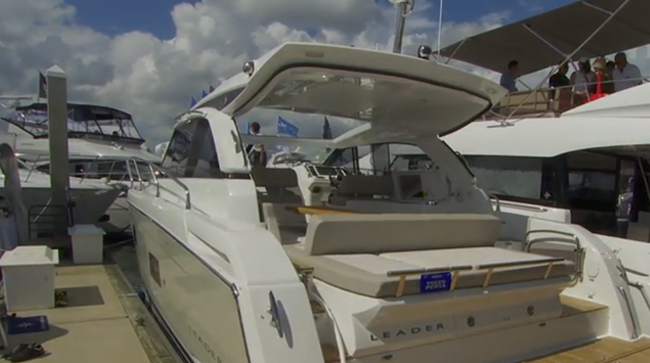 The 25-foot Leader 8 is already out, and the Leader 36 is on its way. 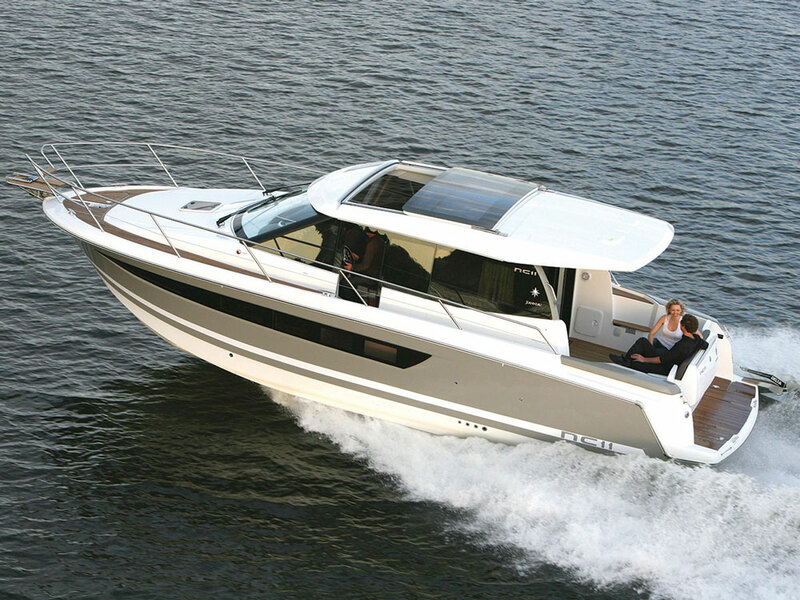 It is expected that Jeanneau will be adding other models soon, so the innovation is likely to continue. 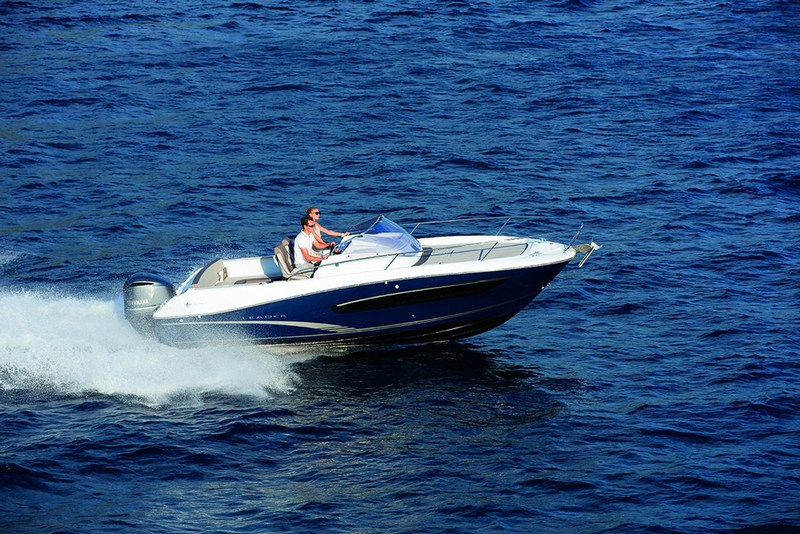 Other Choices: For other sporty cruisers in this size range, consider the Cobalt A40 or the Tiara Coronet 3900. View Jeanneau Leader 40 listings.